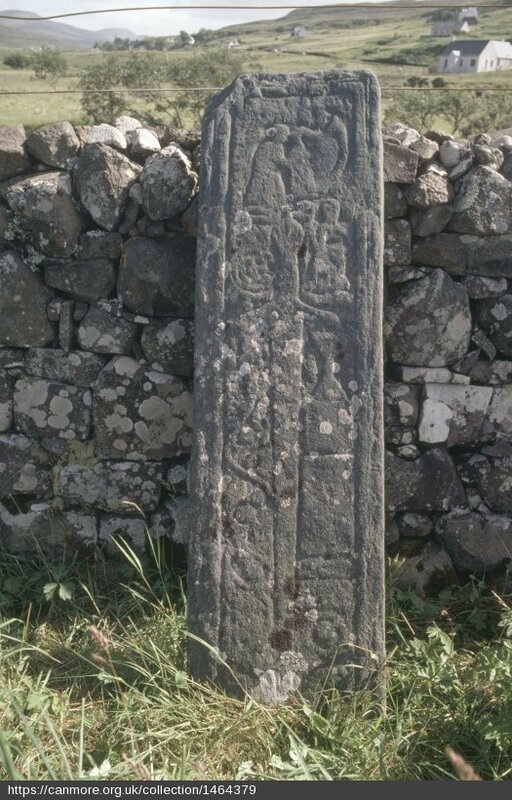 This is a late medieval grave slab, which stands against the boundary wall of Kilchoan Burying Ground, a graveyard in Glasvin, Glendale, in the North-East of the Isle of Skye. The graveyard was apparently originally the churchyard of Cille Chomhghain, the chapel of St. Comgan. This slab was re-used upside-down as a later headstone, but at some point in the 20th century it was rescued and stood upright against the wall. The slab is a good example of the West Highland medieval grave slabs. Its main motif is a large sword, which is surrounded by other familiar motifs - an ecclesiastical figure, a chalice, perhaps a box or chest, and what seems to be an animal whose tail turns into a long panel of foliage. The top of the panel shows a kneeling figure with a harp. The form of the harp is similar to the harps shown on the other two medieval West Highland grave slabs - the ones from Keills and the one from Iona. The Kilchoan slab is pretty eroded from being outside for so many centuries. There is a rubbing (which of course misses out much of the detail) in the Royal Commission volume for the Outer Hebrides, Skye and the Small Isles, 1928, fig 244 & p.151. and there is a nice photograph by Keith Sanger of just the harper, available online via the Wire Branch of the Clarsach Society. Right: rubbing by Fred MacLeod, published in the Proceedings of the Society of Antiquaries of Scotland, 1910. Below: Photo by Betty Willsher, c.1970s-90s. Used under license from canmore.org.uk.